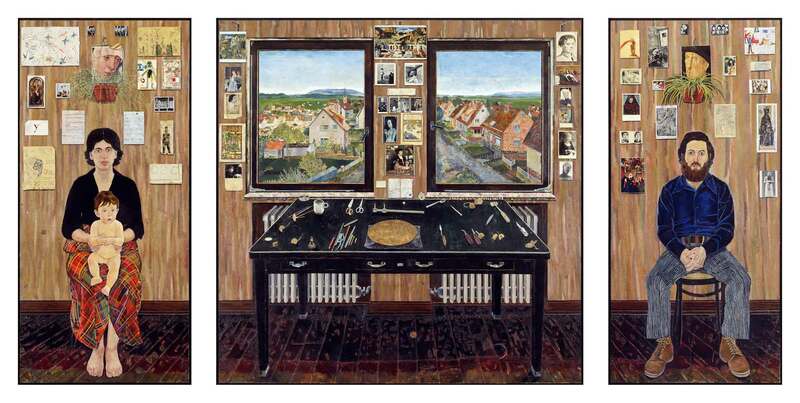 Early in his artistic career, Brooklyn native Simon Dinnerstein received a Fulbright Fellowship to study printmaking in Germany. In 1971, while still in Germany, Dinnerstein began work on what would become his signature piece, The Fulbright Triptych, which he completed in 1974 after returning to New York. Considered a masterpiece of 1970s realism, The Fulbright Triptych is the marquee attraction of a new exhibition of Dinnerstein’s work debuting at the Museum of Art and Archaeology this week. Barker says the new exhibit, The Lasting World: Simon Dinnerstein and the Fulbright Triptych, will have a soft opening July 25, followed by the July 27 world premiere of Robert Sirota’s composition Three Nocturnes, which is inspired by three of Dinnerstein’s most dreamlike and evocative drawings: Night, Night Scene 1, and Purple Haze. The concert will be held at the Missouri Theatre and will feature the chamber ensemble Alarm Will Sound, conducted by Alan Pierson. Both Dinnerstein and Sirota will be present for the concert, which is part of the 2017 Mizzou International Composer’s Festival taking place throughout Columbia this week. Dinnerstein says he derives part of his inspiration from an exhibit he once saw featuring Mexican artist Frida Kahlo. Barker says the exhibit’s official opening will be held in September, when students are back on campus, although the museum will host a meet and greet with Dinnerstein on July 28 from 1:00 to 3:00 pm. An interdisciplinary symposium will be held Sept. 22–23 at MU to investigate Dinnerstein’s aesthetic choices and intellectual context, touching upon art, art history, film studies, music, literature, poetry, history, psychology, religious studies, and women’s and gender studies. The exhibition, which runs through December 24, also will include a film festival featuring a number of Dinnerstein’s favorite films and a book club discussion based on one of Dinnerstein’s favorite books, Stoner, John Williams’ story of a poor farm kid from Boonville who attends MU to study agriculture but falls in love with literature. A catalog has been produced to accompany the exhibit, and Barker plans to organize a scholarly volume composed of interpretations of Dinnerstein’s work by various MU scholars. After closing here, the Museum will take the exhibit to additional venues in New York and Nevada. One of the paintings in the exhibit, The Sink, is in the permanent collection of the Museum of Art and Archaeology. Dinnerstein says this will be the first exhibit of his work in the Midwest, although he did show a single work in Fayetteville, Arkansas. While he was in Arkansas, Dinnerstein was asked by a University of Arkansas publicist what advice he would give to students.